Yeah, yeah, there was an election earlier this week, but we’re all past that now. What will the first 100 days of the Trump administration look like? For that we (along with guest host Mona Charen) turn to the great Larry Kudlow, who has been a Trump supporter and advisor since the beginning of the campaign. Who will be, who will be out, what policies will be advocated, we cover it all. Also, some thoughts about the campaign and how we all move forward from #NeverTrump. You’ll never have to worry about badly fitting suits or expensive trips to the tailor again. Go to IndoChino.com and enter promo code RICOCHET at checkout to get ANY PREMIUM suit for just $389, free shipping included. Get ready to look like a million bucks! We’ve reached the end of the road folks — this is it– our last Ricochet Podcast before the election for the 45th President of the United States. Rob Long couldn’t join us us today, something else came up. But in his stead, Peter and James carry on with two of our favorite guests: El Rush Bro himself — the great David Limbaugh, and Ricochet alumnus (and equally great) Mollie Hemingway (@molliehemingway). David makes the case for the Republican nominee, while Mollie discusses the schizophrenic media coverage of the race. Also, fair and balanced podcasts, courtesy of Ricochet Member Curt North (featuring a rare cameo from the mysterious @BlueYeti himself) and James and Peter make their predictions for next Tuesday. Thanks to all for your loyalty to this podcast, this site, and our advertisers through this entire campaign season. It’s very much appreciated. See you on the other side, folks. With the election just about upon us, (hooray!) we strive to bring both points of view to the candidate. Representing the #NeverTrump position we’ve got Wisconsin talk radio show host Charlie Sykes, who takes us through his reasons for opposing Trump. On the other side, it’s Victor Davis Hanson, who makes his case with his usual clarity and logic. Fair and balanced, that’s what we are. Also, the Al Smith dinner, the impact of Wikileaks, and a recap of last week’s meet up in Manhattan. Personal to Mr. Charles Berry of St. Louis, MO: a hearty and happy 90th birthday, sir, and thanks for all the great tunes. Many more of both, please. Folks, we’re getting to the final act of the election and there’s no one better qualified to help us parse it than the Weekly Standard’s Andrew Ferguson. We talk Hillary, we talk Trump and his bizarre relationship with Vanity Fair editor Graydon Carter, the Beatles, and of course, the Nobelist himself, Bob Dylan. Also, where might we be headed from here (and by “we” we mean Ricochet)? @FatherB. asks the question in his post “In which I disparage this website and its founders” on the member feed and as promised, gets it answered on the podcast. Are minorities leaving the G.O.P. or are are white voters in general just going the way of the Dodo bird? That’s the question we ponder (Rob Long ponders it at a chi chi bar in Manhattan as you’ll hear). The we chat about the debate with Ramesh Ponnuru and about Tim Kaine’s weird position on abortion rights. Later, Jim Geraghty, the Morning Jolt newsletter author (and host of the Three Martini Lunch podcast), joins to discuss the N.F.L.’s sinking ratings and whether they have to do with the injection of politics into the game. Also, the state of the Presidential race, the fight for Congress, and courtesy of Ricochet member @rushbabe49, our podcasters reveal their happiest memory. Spoiler alert: one isn’t very happy. When we want a voice of sanity and reason to help us distill the election and the world at large, we turn to our good friend Mitch Daniels, the current President of Purdue University and the former Governor of Indiana (and in our alternate universe, the President of the United States). He schools us on Gary Johnson, our addiction to debt, and political correctness on campus. Then, our fellow podcaster Andrew Klavan joins to chat about his new book The Great Good Thing: A Secular Jew Comes to Faith in Christ. Also, what would you tell Donald Trump if you were his debate coach? We give our thoughts on the show, but tell us yours in the comments. Another week, another show in which gab and you listen. This week, our guests are two world class gabbers: The Hoover Institution’s Bill Whalen stops by to discuss the state of the race, and some predictions for the next 55 days. Then, author and Ricochet Podcast Super Fan Tevi Troy Skypes in to chat about his new book Shall We Wake the President? : Two Centuries of Disaster Management from the Oval Office. Also, Doc Jay’s Do NeverTrumpers Lose Their Right to Whine?, the tightening polls, and why presidents must love Spock. Highly logical. Better Fabric. Better Fit. Better Collar. The perfect mix of old school style and modern design. Get 20% off your first purchase by visiting criquetshirts.com/RICOCHET and entering promo code RICOCHET at checkout! Let it never be said that this show does not go out of its way to present all points of view on the issues. This week, not one, but two guests from the pro-Trump side of the aisle. First up, Heather Higgins, whose post My Money Is on a Trump Victory has been quoted far and wide. Will she be able to convince the non-Trump supporting podcasters on this show to support the Republican nominee for President? You’ll have to tune in to find out. Then, The Center for Immigration Studies’ Mark Krikorian joins to discuss the upcoming NFL season. No, of course not. He’s here to discuss immigration, Trump, Mexico, and that darn wall and who will pay for it. ¡Ay Caramba! This week, another fair and balanced podcast we bring you quixotic Presidential candidate Evan McMullin. His campaign is a long shot, but his qualifications and demeanor are beyond reproach. Later, the WSJ’s Bill McGurn joins the show. Among the members of the WSJ Opinion Page, Bill is the only pro-Trump columnist and he makes the case for his candidate in his typical straight down the middle of road style. Also, Ann Coulter finds herself in a tough spot, the University of Chicago mans up, and a Ricochet member contributes the new member pitch. We podcast, you decide. This week, author and Manhattan Institute fellow Heather Mac Donald joins the show to discuss her important new book, The War on Cops: How the New Attack on Law and Order Makes Everyone Less Safe. Also, Paul Manafort exits, auto promotion and Ricochet’s editorial voice (or lack of one), and a heartfelt “bye-bye!” to John McLaughlin, who’s long running show, The McLaughlin Group is a distant relative of this very podcast. This week, Hillsdale President Dr. Larry Arnn stops by to make the intellectual and academic argument for Donald Trump (h/t to Ricochet member @rushbabe49 for her post This Might Change some Minds on the Election). Can the good doctor sway @roblong, the resident #NeverTrump representative on this podcast, into voting for the Republican nominee? The answer lies within. Public service announcement: if you’re not a member of Ricochet and enjoy this podcast, be one of the 1500 and JOIN TODAY. A few times a year, we banish the guests and open the floor you, our cherished members. And you didn’t let us down — dozens of great questions were submitted. Thanks for participating. We’ll do this again after the election. P.S. If you’re not a member, you’re really missing out. Do the right thing for yourself, your country, and for us and JOIN TODAY. We open with some thoughts on the just concluded Democratic convention, and then segue into our guest, Avik Roy. 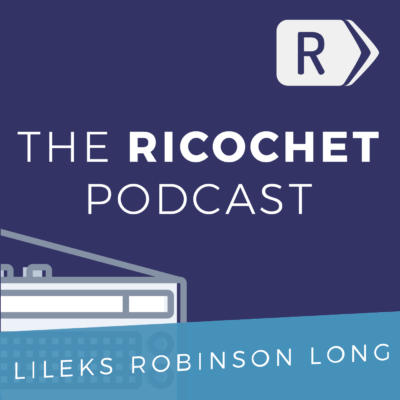 His interview with Vox has been discussed extensively on Ricochet, and we give him the full court Ricochet Podcast press. Is the GOP on life support as Avik suggests and can be saved? Or, is everything just fine, and the party should stay the course? We delve into all of that with Roy in a very provocative (but civil!) conversation. Also, some thoughts on auto-promotion and the new version of Ricochet. If you’re reading this and you’re not a member — what are you waiting for? Join NOW. We need you! The moment we’ve been preparing for all year finally arrived this week: Donald J. Trump is the Republican Party’s nominee for President of The United States. With the help of the Washington Post’s ace political reporter Bob Costa, we break down the whole week, from the family member speeches, Ted Cruz’s speech, Trump’s own speech (and Peter Robinson’s brush with the Trump campaign), as well as some thoughts on the changes going on this week at Fox News. We are your voice. This week, Lileks is on vacation so we asked our good friend Larry Kudlow to sit in his chair as we welcome the Manhattan Institute’s and Wall Street Journal columnist Jason Riley to the show to discuss the events of the last week. Yes, we also cover the presumptive nominee, and Larry makes a valiant effort to convince one of the hosts to support his candidate. Was Larry successful? Tune in to find out. This week, we take a little break from politics to bring you one of our favorite people — writer/director Whit Stillman, who’s new movie Love & Friendship is in theaters now. We talk Jane Austen (the movie is based on Austen’s novella Lady Susan), his writing process, and some of Stillman’s favorite films. Then, Charles C.W. Cooke, newly minted National Review Online Editor (and co-host of the wildly popular Mad Dogs and Englishmen podcast) stops by to discuss the seemingly endless Brexit fallout. Also, Ricochet member Brian Wolf’s Confessions of an #AlmostNeverTrumper … And What Could Make Me Change My Mind makes our podcasters confess what might change their mind. We’re off next week. Have a great 4th, everyone! There’s a sit-in in the House, and the Emperor has no money. Seems like old times, except for the fact that we invited Twitter-famous Sonny Bunch to sit in for the traveling Peter Robinson. In addition to the fore-mentioned topics, in this completely Member Feed inspired show, the guys cover Gaius’ post A Thought Experiment: Inspired by Sen. Rubio, Robert Zubrin’s Campaign Launched to Free the Delegates, among others. Also, what’s their most anticipated summer movie? The answer may surprise you.